Just wanted to say thanks for letting me be in a somewhat grumpy mood yesterday. The day did improve as it went on, especially because I chose to do something fun - I made my Birthday/Christmas wish list. Well my wish list at least as far as clothing is concerned! I have chosen to participate in a No Shop November along with Heather at Style Journey - which means no clothes or accessory shopping for myself. I tend to do this at this time every year with my birthday (Nov 25th) and Christmas so close together. It's a good time of year to do it. And I have enough maternity items to get me through to the end I think, so no more shopping for me. Plain and simple. This doesn't mean it isn't fun though to "window shop" through the magic of the Internet and pick out things that I might enjoy having! Here is my wish list as of this moment! 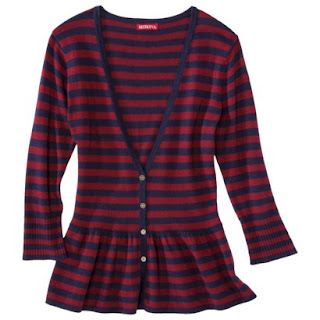 This peplum cardigan from Target is adorable. The peplum would hide my extra belly after baby is born and cardigans are going to be great to throw over a nursing top. This red and blue stripe is festive for the holidays too! What does the fox say? I am obsessed with all things fox. My poor son already has a ton of fox themed clothing - might as well have mom match with these fun socks from ModCloth right? I have been loving the embellished sweatshirts I've been seeing all over the place this year. I know once the baby is here I'm not going to want to take the time to accessorize as much if I am going somewhere, so this would be a good option instead! And it'll still be cozy because it's a sweatshirt! 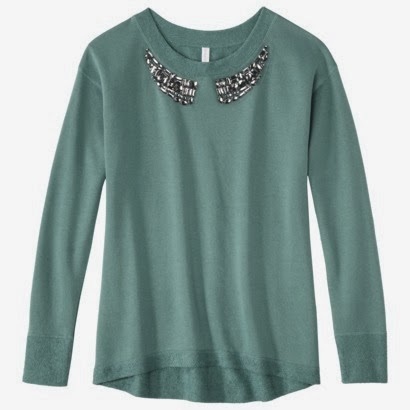 The one above here is from Target, but there are some really cute ones at Old Navy too. Even though I don't shop there as much as I used to, I still love me some LUSH products. 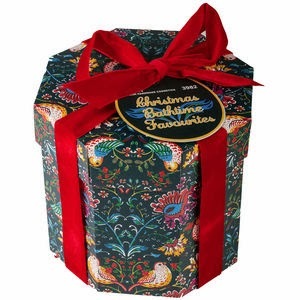 My favorite time of year for LUSH is always the holiday season - this fun hat box is awesome, it has all my favorite bath bombs and bubble bars. I may not get a lot of relaxing time after baby comes, but this might be nice to have for relaxation before he arrives! 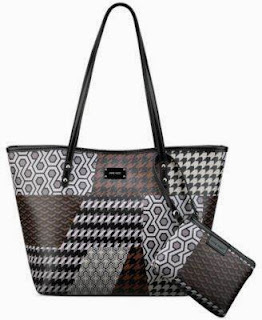 I have been really pairing down my purses but I can't help but love this one from Nine West. I saw it at DSW a few weeks back, but it's not on their website. It's available a whole host of other places though. What I think is awesome is the matching wristlet - I could throw that in a diaper bag with my personal items or throw it in the bag if I'm out sans baby. And the colors match everything! Brown, black, gray, etc. 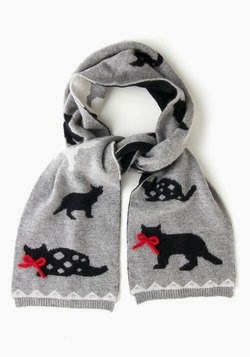 How could I not love this scarf from ModCloth with black cats on it?? It looks nice and warm and is a great way to pay homage to my furry loves. Cause even if I'm having a baby, I am still a crazy cat mama too. Always will be! 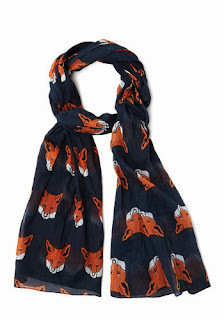 Another scarf and another fox item from ModCloth. This one is more of a fashionable scarf, less for warmth, but I can think of plenty of sweaters in my closet this would go with. I see scarves working into my new mama wardrobe quite nicely! 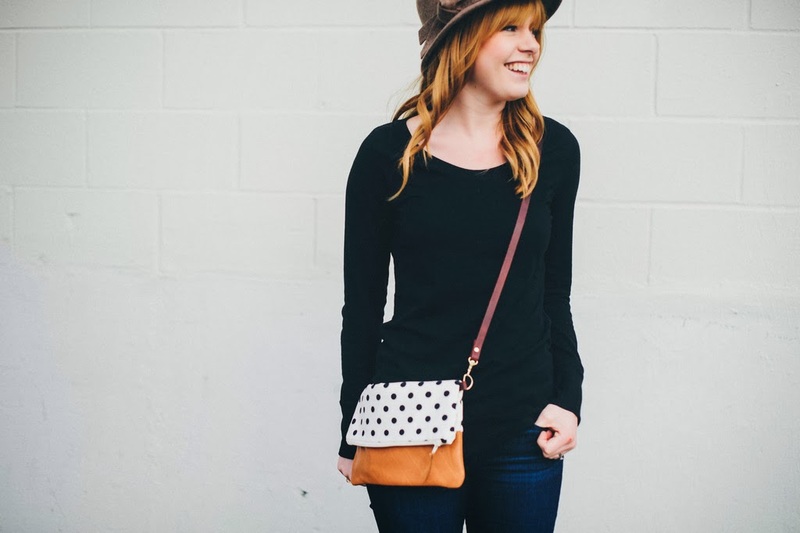 I've been ogling these adorable handmade bags from Rouge and Whimsy for quite some time now. I love this polka dot crossbody fold over and also the polka dot tote bag that she has for sale. The crossbody seems like a logical choice for after baby - again, I can put most of the stuff in the diaper bag, but a few things for me in this little guy, throw it across my body for hands free access to my little guy and I'd be good to go! And finally we have this lovely Aztec sweater from H&M. Again, I'm seeing Aztec print almost everywhere, but I do love H&M quite a bit so I chose this one. This sweater seems perfect to me - warm, cozy, easy to wear with leggings while I'm still losing baby weight, can again be worn over a nursing tank pretty well. What's not to love? So there you go! 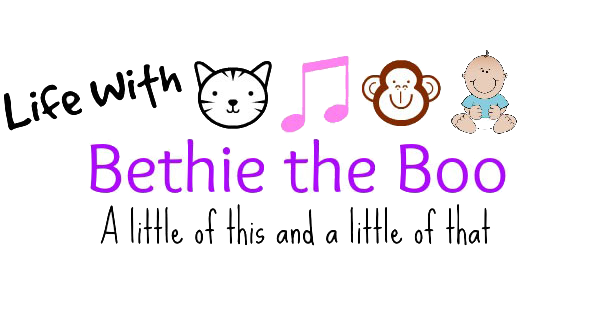 I've been telling my family to pretty much just do gift cards for me since I don't know quite how my body will be post baby quite yet, but I wouldn't cry if any one of these items showed up as a birthday or Christmas gift for me (PS, hey Pants Monkey? 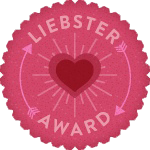 You reading this? wink wink nudge nudge). Are you already looking ahead to Christmas? What's on your wish list this year? Glad your mood improved yesterday and hey today has to be a great day! It's hump day! Love your wish list! Ooohh, the cardi and scarf are delights. One thing I've noticed about people who post regularly, like you, and people who post sporadically, like me, is that you show your bad days as well as your good ones. When I feel grumpy or blue (which is no less than you), I clam up. 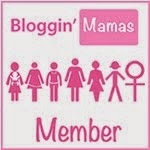 I worry that exposing that negativity on my blog will cause me to lose readers. Apparently you don't. I suppose your readers (including myself) expect you not to be always happy. Conclusion -- I think you're more candid and courageous than me. THAT PEPLUM CARDI! LOVE! Great picks! And I find that shopping online is better than shopping in stores. The clothes always fit, and paying is just such a hassle, I never actually buy anything! I "window" shop a lot! Internet shopping is like a stress reliever because I can browse, throw things in my cart, but then I never really buy anything after seeing the actual price. 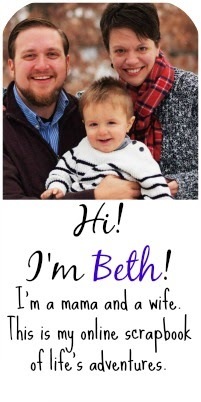 The striped peplum cardigan will be perfect for after baby. 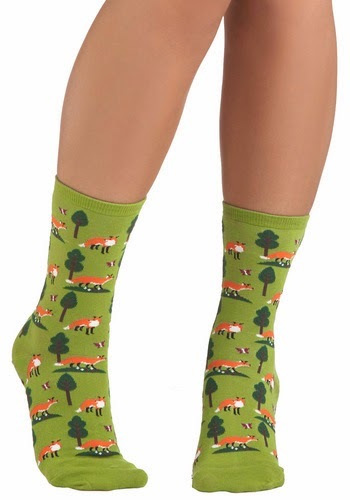 Plus, the fox items - you will be one foxy mama! All of your picks are great! I love everything here! Especially the socks and the scarves, just too cute! i have been on the hunt for the perfect aztec sweater...that h&m one is cute! Lurv this wish list!! I especially lurv the fox socks and scarf!